The Achilles tendon attaches the calf muscle to the heel bone. Jumping, climbing and strenuous exercise can strain the tendon and calf muscle. This can cause the type of inflammation known as Achilles tendinitis. The injury can be mild enough that it can be treated by over-the-counter medications. It could also be so severe that it must be repaired surgically. Chronic tendinitis can cause microscopic tears in the muscle. A tear can weaken the tendon and increase the risk for tear or rupture. 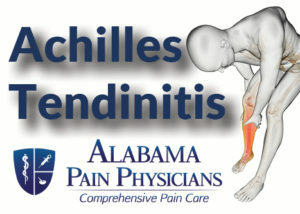 The pain associated with Achilles tendinitis typically begins as a mild ache in the back of the leg or above the heel. It can occur after running or other sports activity. Episodes of more-severe pain may occur after prolonged running, stair climbing or sprinting. You might also experience tenderness or stiffness, especially in the morning, which usually improves with mild activity. Treating this condition can involve rest, stretching exercises, compression, elevating the heel, ice packs, and anti-inflammatory painkillers. If necessary, the doctor may order a steroid injection to reduce chronic tendon inflammation or a series of platelet rich plasma (PRP) injections to stimulate healing. If none of these treatment options work, surgery might be suggested to repair the injured tendon. At Alabama Pain Physicians, our goal is to better the quality of life of our patients. We take your pain seriously and strive to establish an accurate diagnosis along with a treatment plan to ultimately minimize your pain. To determine the exact cause of you pain, our physicians will perform a physical exam and use your complete medical history to help find the best treatment option suited for you. 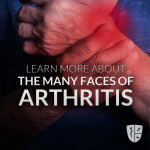 You may also need imaging studies and test to help the physician determine the cause of your pain. 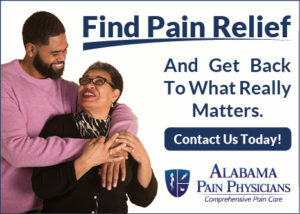 Contact Alabama Pain Physicians today and let us help get you on the right track to managing your pain.